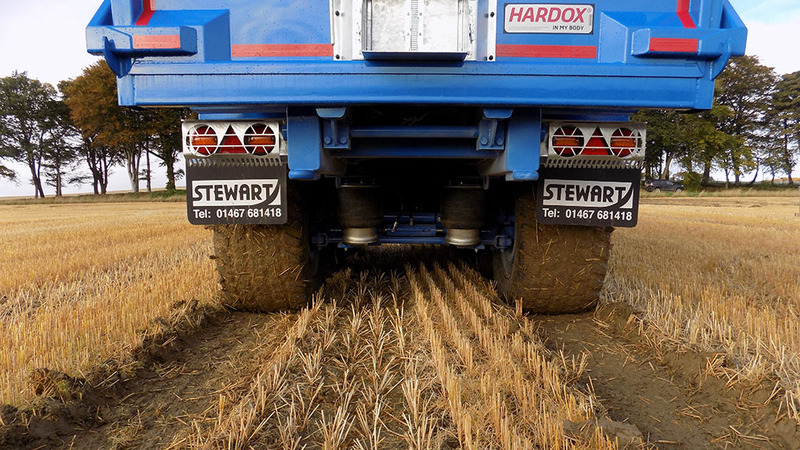 Armed with a test rig and a sloping field, we find out how much of a difference various trailer tyre pressures have on the land and efficiency. James Rickard reports from Turriff, Scotland. Our test rig allowed us to compare effects of different tyre pressures, both on soil and efficiency. Whether it be an arable farm, livestock farm, large or small, pretty much all farms in the country will have a trailer of one form or another. But, have you ever stopped to consider the impact the trailer is having on your soils and efficiency? 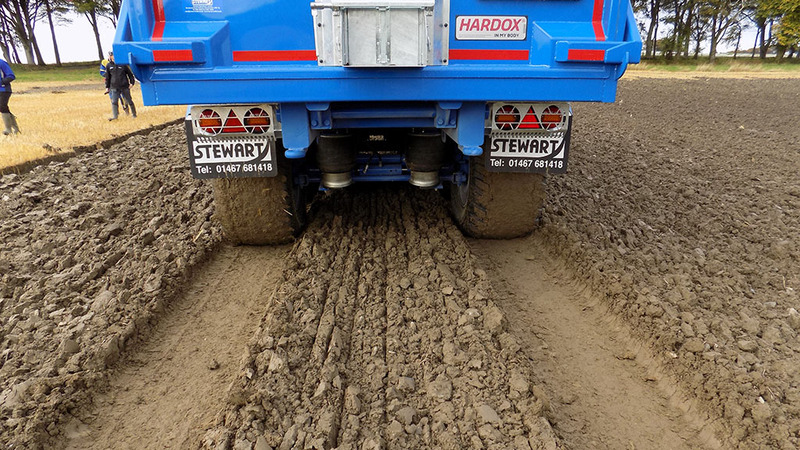 In many cases, with a few simple adjustments to tyre pressures in particular, substantial improvements to soil structure and all-round efficiency can be found. Granted, in many cases, tyre pressures are set at a level to be safe on the road, with little that can be improved upon for in-field performance. However, with the advent of modern tyre technology and systems such as central tyre inflation, it is possible to have the best of both worlds; one setup for the road and one set up for the field. But how much would you really gain by doing this? To find out, we teamed up with Michelin, Stewart Trailers, Philip Wright Solutions and Maxwell Farms to find out. 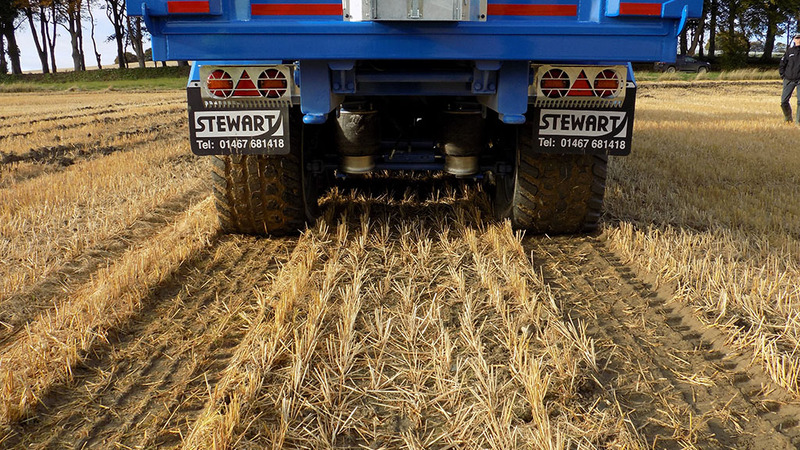 The aim was to see what effects different tyre pressures have on soils and efficiency in different situations, namely driving on a stubble field and driving on a ploughed field. To gauge the impact of machinery travelling in-field, several areas were also looked at including water infiltration rates, rut depths and compaction observations. All runs carried out next to each other in quick succession. To measure efficiency, three main areas were looked at which included fuel use, time to complete the course and average wheelslip. Apart from time, Fendt telematics where used to determine fuel use and wheelslip. While the tractor was set to a cruise speed of 10kph, wheelslip differences meant the course was completed in different times. As the results show, all three measured elements increase when higher tyre pressures are used, leading to a reduction in overall efficiency. 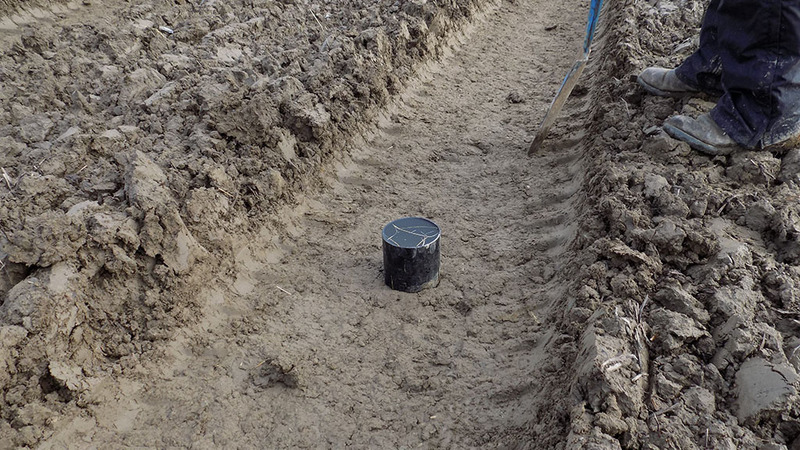 To get an idea of how compacted the soil structure became by driving over it, one of the methods we used was to conduct a water infiltration test. Essentially, the more compacted a soil structure gets, the less porous it becomes, therefore less able to absorb water. After each run, infiltration tubes were placed in the wheelings left by the tractor and trailer. Where the ground had been compacted more by the higher pressure runs, it took significantly longer for water to infiltrate into the soil; in some cases, not at all (see results). Compared to non-run on ground, which has an infiltration rate of 180ml/hr, driving over ground makes a significant difference to porosity. Philip Wright of Wright Solutions commented: “Lack of porosity in the soil will have an effect on yields as soil cannot sustain water, air and nutrients. Roots will also be stunted by the resistance created by the compacted soil. 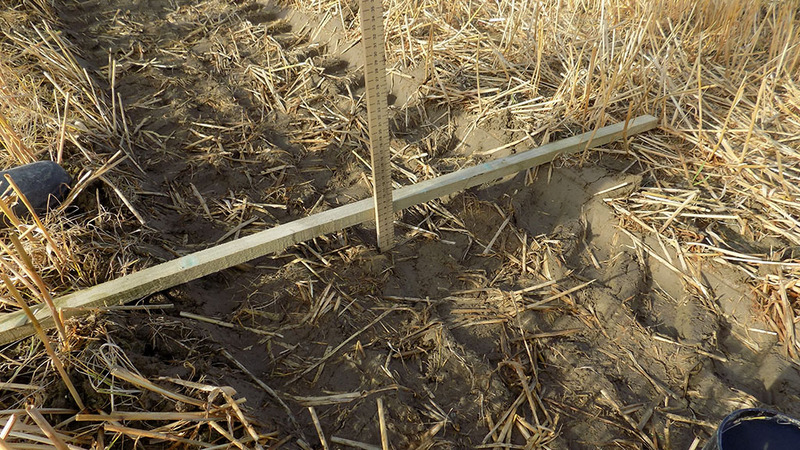 A quick indicator of how much machinery is impacting on the land is a measurement of rut depth; the deeper the rut, the greater the impact (see results panel). However, the best indicator of impact is below the surface. Where the field has not been run over, soil structure was well fractured with a good crumble. When run over, both high pressure and low pressure runs had an effect down to about 10cm. But in the high pressure case, the top surface was much more intensely compacted showing signs of ‘plating’ with horizontal layers forming, compared to the low pressure run which was a lot less abused, still showing signs of fissures and pores. Mr Wright said; “Picking at the walls of the hole with a hand chisel revealed the amount of resistance in the soil, with less resistance the deeper you go. Subjectively, it was twice as hard to dig holes in the high pressure wheelings as it was in low pressure wheelings. 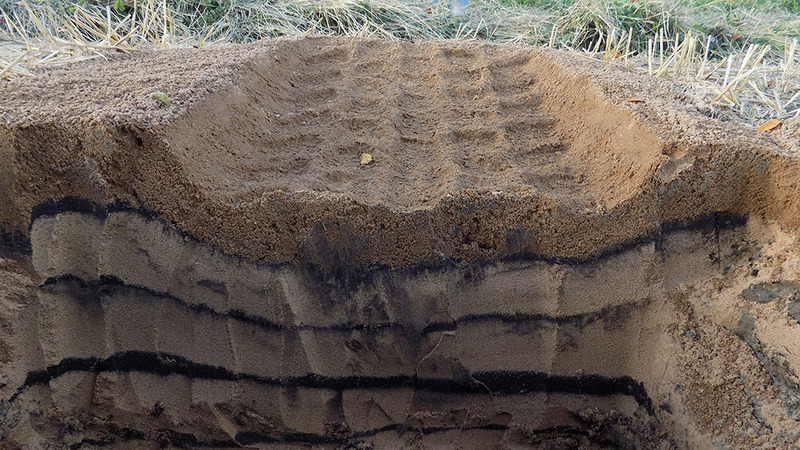 By running over 80cm (31in) deep holes filled with layers of coloured sand, this showed the impact on the ground between the two different pressure settings. In the case of the high pressure settings, the effects could be seen down to 53cm (21in). The sharp angled pattern created in the layered sand also showed how aggressive high pressure tyres can be. In contrast, the pattern created by the low tyre pressures is much less severe and more gradual. Sand is also only moved to a depth of 45cm. By tracing around a trailer tyre with white powder, we were also graphically able to see and work out tyre footprint, and how much more footprint can be gained by lowering tyre pressures. Footprint of a trailer tyre with the higher pressure setting was 4,508.5sq.cm - 63.5cm (25in) wide by 71cm (28in) long. Footprint of a trailer tyre with the low pressure setting was 6,006sq.cm - 66cm (26in) wide by 91cm (36in) long. By using lower pressure tyre settings, footprint of the trailer tyres could be increased by 28.5 per cent. This is almost the equivalent to adding an extra axle under the trailer, when using high pressure settings. 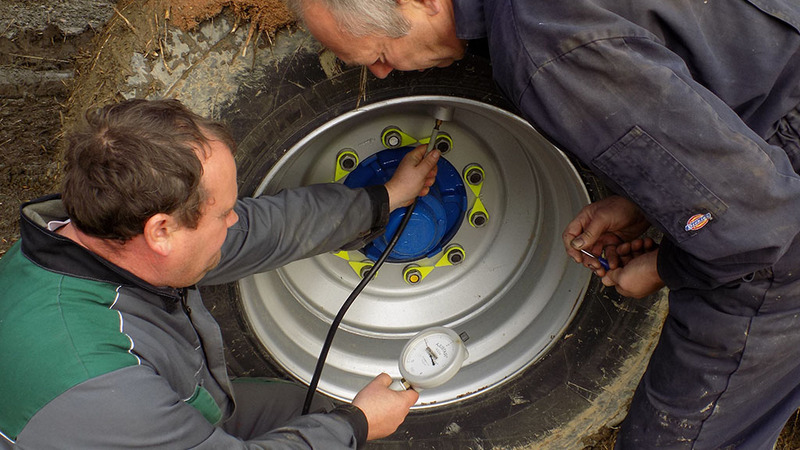 It is conclusive that different tyre pressures have a massive impact on soil and efficiency. The results clearly show an increase in fuel use, time and wheelslip when higher tyre pressure settings are used. Couple this with the increase in compaction, the overall effect is detrimental to both yield and efficiency. Even without data to back-up the runs, the visual difference between high and low pressure tyre settings on the land is night and day. While results will vary from situation to situation, depending on soil types, weather, etc, the overall differences between the high pressure and low pressure results should remain similar, if not even more magnified in certain conditions. 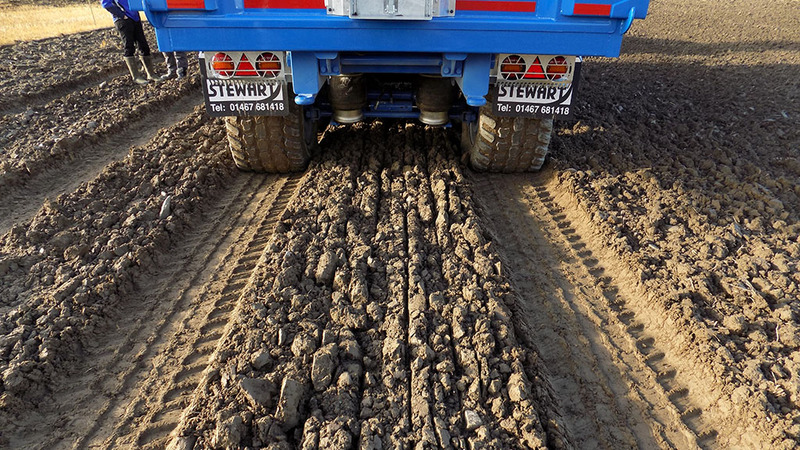 And it is not just trailers which have an impact on the field, any trailed equipment will leave its mark. Unfortunately, while the results point out several benefits of using lower tyre pressures, low pressure tyres cannot be used on-road due to being unsafe. In an ideal world, two different settings should be used; one for the road and one for the field. However, in a lot of cases such as silaging and grain carting where trailers are constantly in and out of the field, this is probably impractical. But, where dedicated trailers can stay in the field, i.e. 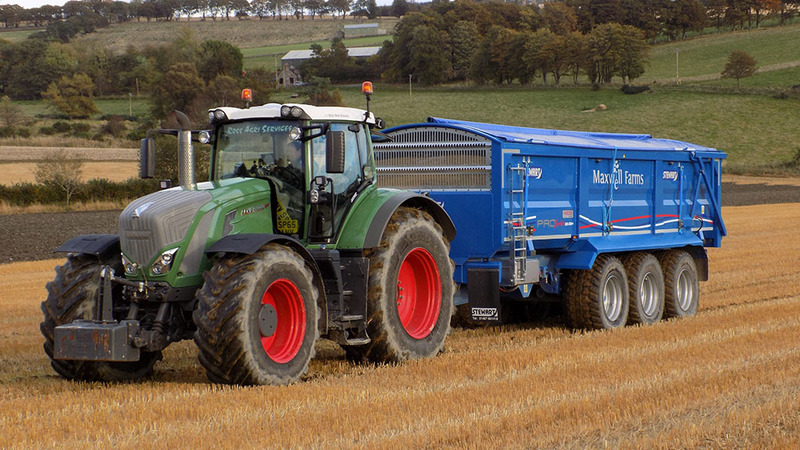 chaser bins or slurry tankers which are serviced by road trailers and tankers, then there is no reason why correct tyre pressures cannot be used. In a perfect world, trailers would have the ability to alter tyre pressures on the go. James Stewart of Stewart trailers said; “Trailer evolution has seen extra axles added, tyre technology developed, excessive weight designed out of the trailer, and lighter and stronger metals used.